I will do an extensive blog post on the mail that is shown with my letter opener, but for now I want to talk about the tool itself. I cannot deal with my mail without my letter opener. Anyone who thinks they are an extravagance either doesn't get much mail or has never used one. I confess I do enjoy the trappings of all things epistolary, and the letter opener is no exception; I used to have one just for decoration, but now - trust me - this baby gets a lot of action. It's crucial for opening envelopes just so, so that you don't tear them or mangle them, and it saves your fingers from paper cuts and general dryness. I liked the weight and heft of my old letter opener better - you can see it in the top right photo in my header - but I lost it, so this new one is its replacement. This new one does its job well, though: sharp enough to tear through paper cleanly, with the proper motions, but not sharp enough to wound clumsy me. If you get a lot of mail and haven't tried a letter opener, I highly recommend one. I have to get a letter opener to leave in the glovebox because Greg picks up my mail from the post office box, then picks me up at work and I can't NOT open my mail right away ... it is a one hour commute home ... unopened mail would burn a hole in my lap. That would be a difficult situation for me, PostMuse - I'd want to open my mail, too, but I get horridly carsick so I couldn't read it. (I have a hard time even reading maps without feeling awful.) More power to ya if you can read in the car! 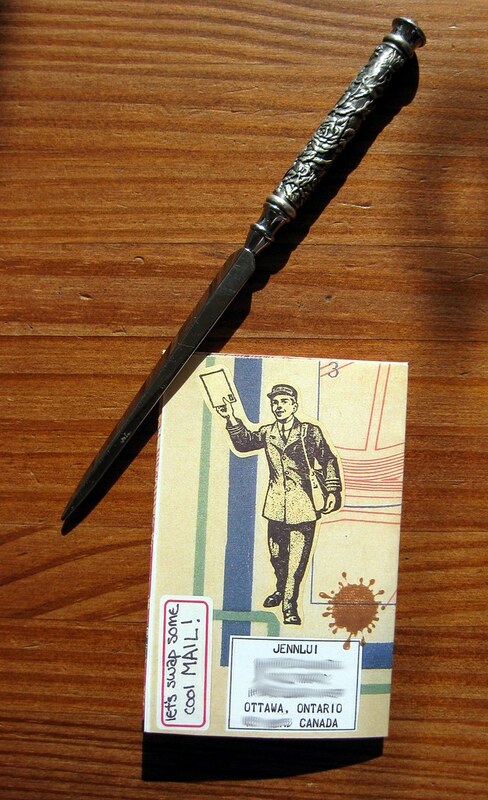 A letter opener is another of the epistolary tools that I covet! Alas (poor Yorick), I think for now my scissors do an all right job of opening my letters for me. At least I have an envelope moistener - I personally couldn't live without one! I have a plastic letter opener with a tiny metal blade that I picked up for about two dollars and it's a godsend. Not particularly pretty or nice, but very useful. I could never go back to opening mail with my fingers. Yours looks gorgeous. Ps. I just noticed your favicon and I love it :D I hope you haven't always had and I'm just ridiculously unobservant (I often am). MM, I completely agree about having a letter opener, it's well worth the investment! It was one thing, ripping envelopes open with my hands when all I got were bills and advertisements, but once I started receiving mail art, I had to get something that would create a clean cut. Also, I'm with Bianca, you're favicon is stupendous. I certainly couldn't live without my letter opener. I am in fact almost completely incapable of opening an envelope without one (well, scissors would work, but that's cheating). My own letter opener is brass with a decoration of a unicorn on the handle, and I always feel suitably medieval whenever I open a letter with it. Very nice Missive Maven. The difficulty now is deciding which letter opener to purchase. And do I go looking for one, or let one find me (you know - just happened upon it in an antique shop). Ack, but I am need very soon. Thus, maybe I'll give another hint to my husband, saying we should do a little shopping together. 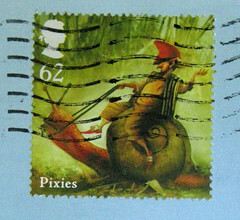 Can't wait to have one for my mail is being quite "ill-treated" by my opening. I very much need a "proper" letter opener. I have one of the plastic ones. I've gone through three of them already. The tine breaks off sometimes.